It's now the end of 2017 and I've still seen very few new containers from Blue Bunny, so let's pick up something from 2016. 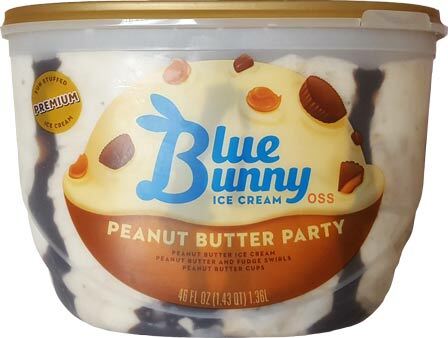 At one point, someone left a comment that this one is a failed imitation of Blue Bunny's earlier "Peanut Butter Panic" which had the same basic components. Unfortunately there is a bit of freezer burn at the top of this one. I scraped off a bit but should have scraped a bit more as my first serving was a bit crunchy at times. I wound up swirling (smooshing!) everything together so at least I could analyze the flavor. Unfortunately that didn't fill me and I went back for a second serving. It was that or dive in to the Reese's covered pretzels. To sum up this tasty looking photo, let me say that there are times that I enjoy this ice cream and then times I hate it. In these first two quick back to back scoopings I ranged the gamut from wanting to spit this one out to not wanting to stop eating (and making myself a bit too full). The high point is when you bite in to the plentiful peanut butter cup chunks. Just the right size and hardness, they add a fun blast to whatever scoopful they are in. The low point comes in when the peanut butter swirl hits you with some kind of odd blast that in turn tries tripping your gag reflex. What weird ingredient is in here? In general peanut butter is awesome but there are times when it can be made oddly. That seems to be the case here. 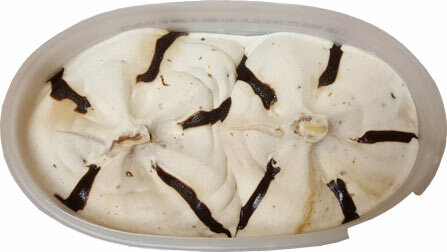 On Second Scoop: Despite the weirdness of the pb swirl, it's hard not to enjoy a flavor that is this busy. Today's serving was probably more swirl influenced than pb cup influenced, but I still found myself eating it quicker than I should have (though I didn't make the mistake of overfilling myself with a double serving today). I wouldn't say rush out and get this, but if you don't mind blowing a couple bucks the next time it's on sale, I say try it with lowered expectations and go from there. Final Thoughts: I like this one more and more, but I needed to come back and point out something. Why do I always feel more hungry when I finish my afternoon mug of this ice cream? The review that never ends: I found the problem. 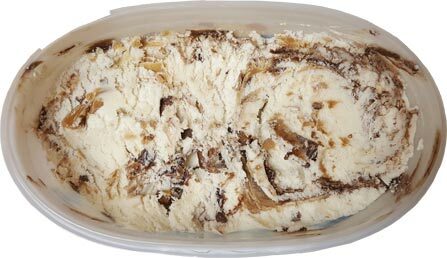 It's not the pb swirl, it's the fudge swirl! I got a ton of the fudge swirl on the final serving and it's totally ruining the experience for me. Bleck! I found this to be very good if you're a peanut butter fan. Loads of peanut butter flavor in every spoonful and lots of mix-ins. 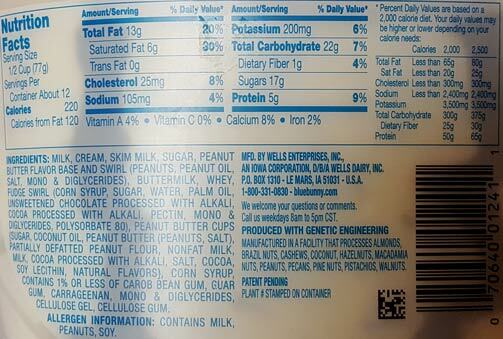 There's not many peanut butter flavors out there so a decent mid-grade like this fills an important niche.